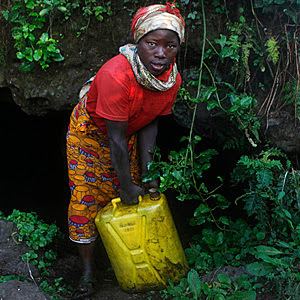 Africa's underground water supplies are 100 times larger than what is on the surface, suggesting groundwater resources could promote development, improve food and water security, and help Africans adapt to climate change, a new study has found. "The resources are vast in some areas, quite considerable," says Richard Taylor, a Canadian geologist at University College London who co-authored the study published this week in the journal Environmental Research Letters. The researchers created new maps that show the quantity of water stored underground across the continent. They include huge aquifers beneath the Sahara and Kalahari deserts that store rainfall that fell as far back as 5,000 to 25,000 years ago. These aquifers, however, are hundreds of metres below the surface and using the water would not be sustainable, as they are not renewed anymore. The more useful groundwater resources are the ones in semi-arid areas of tropical and subtropical Africa, which have the most variable rainfall on the planet, Taylor told CBC's As It Happens Friday. That variation poses a challenge for people living in those areas, as they may go for long periods of time without rain. But they could use the groundwater to tide them over, Taylor suggests. "It's something that could be used to make drinking water supplies or irrigation water more reliable," he said. "It's something you could draw upon, and then it's renewed when the rain does fall." Taylor said predictions about water scarcity in Africa in the future as the climate changes have so far been based on the flow of water through Africa's surface rivers. "You get often overly pessimistic projections of the situation for many people and many countries in the future," he said. "We're trying to bring groundwater into the equation for people talking about resilience to climate variability and also trying to address concerns about freshwater security and food security." Taylor suggests that Africa's groundwater supplies mean that much more of its arable land could be irrigated than the current five per cent — which is far below the global average of 20 per cent — allowing more food to be grown on the continent.